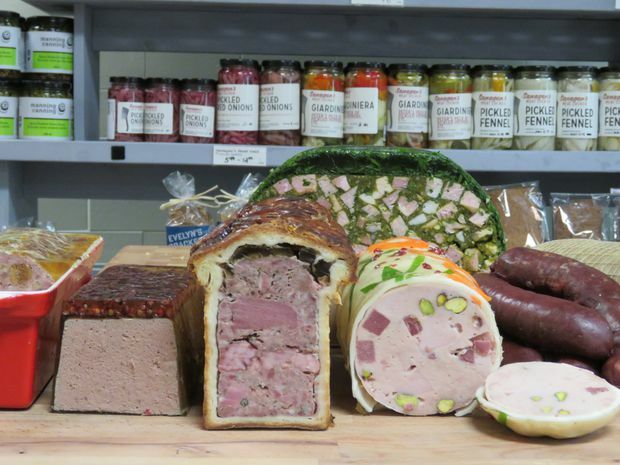 An assortment of Scott Draper's pâté en croûte. 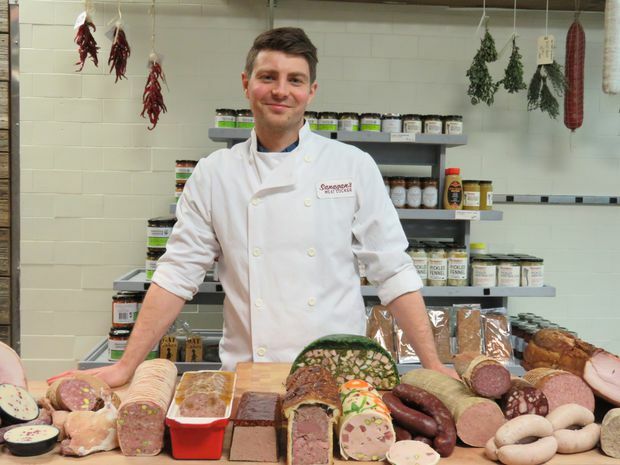 In the days leading up to Canada’s 150th birthday, Scott Draper, a butcher at Sanagan’s Meat Locker in Toronto, had his head down creating a pâté en croûte worthy of the occasion. With Canada as his inspiration, he made a terrine with pheasant at its centre, surrounded by a deep-red venison pâté studded with green pistachios, and encased it in a glorious golden crust fashioned into a canopy of maple trees. It was a masterpiece of meat, aspic and pastry. With so few practitioners in Canada, Draper bemoans the fact he has to set his own standards. So Draper turned to books – many of them historical, given the subject matter – but stumbled upon his greatest resource when he reluctantly joined Instagram. 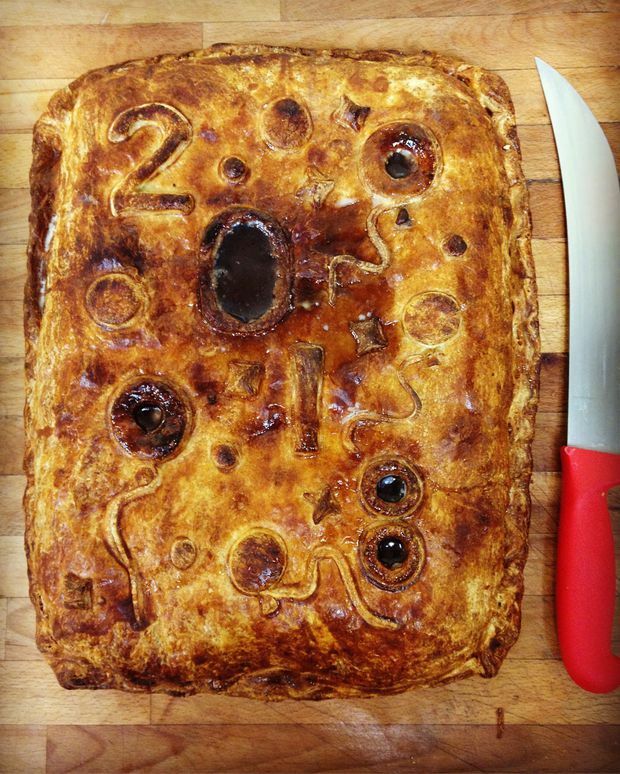 No surprise pâté en croûte has a social media following, given that the finished product is so visually striking. “I found a lot of practitioners willing to share dough recipes, ratios, and grinding techniques in private messages,” he says. In recent weeks, he’s opened the Pie Room, a restaurant with a kitchen devoted solely to savoury pastries, including English pies, pâté en croûte and pastry-wrapped meats, such as Beef Wellington. There have been periods when interest in this meticulous culinary art form waned. But lately, it’s turning up in some of the world’s great restaurants. At the Hind’s Head in Bray, England, chef Heston Blumenthal serves a striking duck and guinea fowl en croute. San Francisco chef Dominique Crenn plans to serve pâté en croûte at her new restaurant, Bar Crenn. The roots of this complex dish are ancient. Apicius, a cookbook dating to Imperial Rome, includes several recipes for forcemeats – the seasoned mixture of ground meat and chopped garnishes provides the base for pâté en croûte. L’oreiller de gibier à plumes. Many master charcutiers are European, and France is synonymous with exceptional skill in the craft. One of the country’s most esteemed practitioners is Gilles Verot, of Maison Verot in Paris, who is a master of this sumptuous mix of game birds, sweetbreads, truffles and foie gras. Draper followed in his footsteps this past Christmas, making l’oreiller de gibier à plumes, a large free-form pâté en croûte fashioned after the French classic, l’oreiller de la belle Aurore. Protecting the craft is serious business in France. Charcutiers from around the world descend on Lyon for the annual Championnat du Monde de Pâté-Croûte, a culinary competition where winners of global heats compete to be crowned world champion. Watching the videos on their website, you don’t need to understand the language to appreciate the artistry. The real moment of truth in production happens when the pâté en croûte is cut to expose the colourful arrangement of meats and garnish inside. With so few practitioners in Canada, Draper bemoans the fact he has to set his own standards. He’s young and still polishing his skills. And he knows looks can be deceiving. “One of Instagram’s shortcomings is a pâté en croûte can look great but you have no idea about the texture or how it tastes,” he says.